Nowadays, people are more focused on advancing their careers instead of generating offspring for the future. Some of the reasons for this trend is the continuous advancement in technology and high cost of living, especially in developed countries. However, other community governments provide necessary support and social services to individuals or couples who wish to raise a child, while the demand for kindergartens and day care centers for youngsters increases. Child care has been a lucrative business in modern times as they provide supervision and care for children while their parents are earning the family’s living. Kindergartens are some of the most important institutions in the community because they help facilitate the development of proper social behavior in children where parents may lack the resources or time to see to this task. That is why you need to have an impeccable website design if you want to impress and gain your clients’ trust. 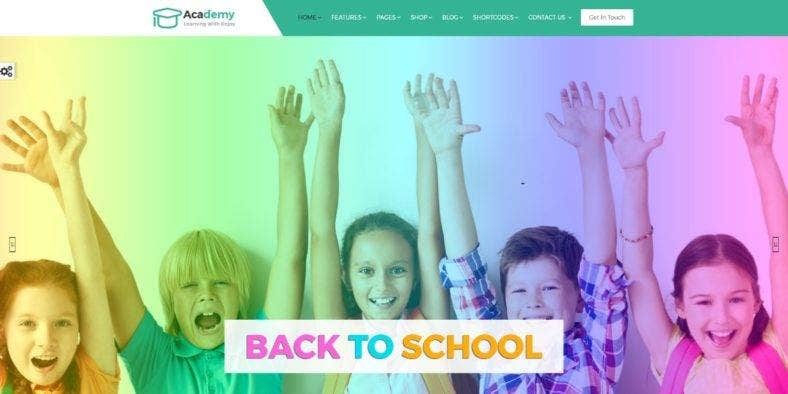 So, here is a collection of fun and colorful kindergarten school website templates for you to use or find inspiration from. 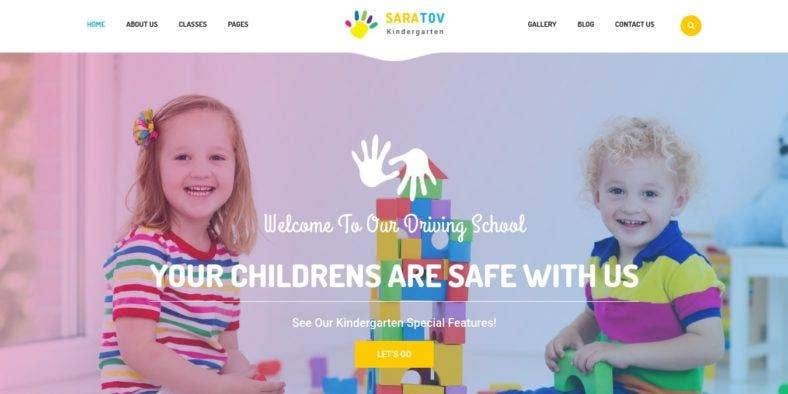 Professionally built with clean designs and reliable functionalities, these themes will help you build a gorgeous and trustworthy website that children and their parents will surely love. To start with, here is a kids’ center and kindergarten responsive website template with a multi-page design integrated with lots of awesome features and customization options. Built with the latest web design technologies, Sunrise includes features such as a tick-to-top menu, parallax effect, a custom slider, Megafooter, a working Contact Form, Google Map, Google Fonts, and so much more. It is also cross-browser compatible, so it works with most Internet browsers. 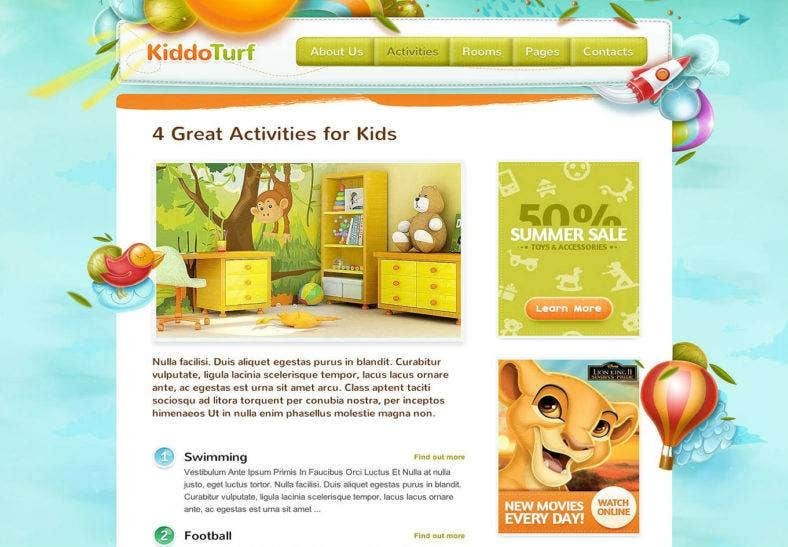 Next is a pre-school website template that can also be used for any other kids’ education-related websites. Kids Tree is a multipurpose website template that comes with over 45 ready-made HTML5 pages, and multiple header and footer layouts. It is developed using a W3C valid, well-commented, and SEO-friendly code so it is easy to customize as well as rank high on search engines. It also includes Live Search and Contact forms. 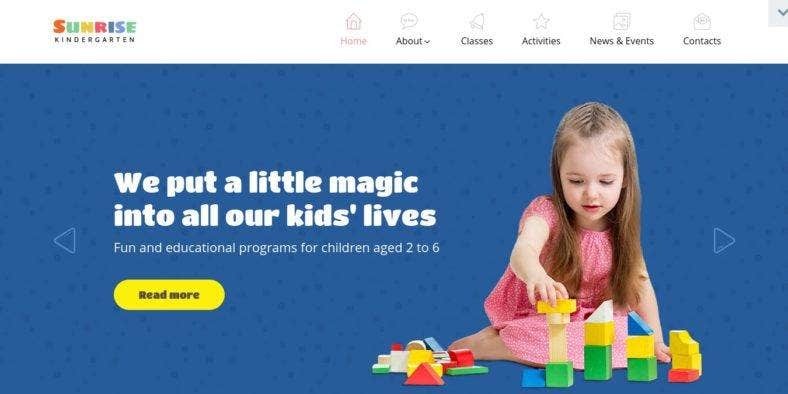 Then, we have Intense, a child care website template that is part of the Intense template family inheriting all of its core features such as a full responsive design, cross-browser compatibility, valid semantic code, and visual perfection. It is beautifully crafted with lots of functionalities so it fits with a wide range of family-themed websites. Other features include working Ajax forms, parallax scroll effects, responsive slider, and many others. Now, here is an HTML5 responsive academic website template for schools, learning centers, institutes, and other education websites. With Academy, you get three home page layout variations with over a hundred HTM pages to choose from. It also offers eight color schemes and nine Coming Soon templates, along with other features included in the theme. It can also easily adapt to a variety of website niches, thanks to its easy customizability. 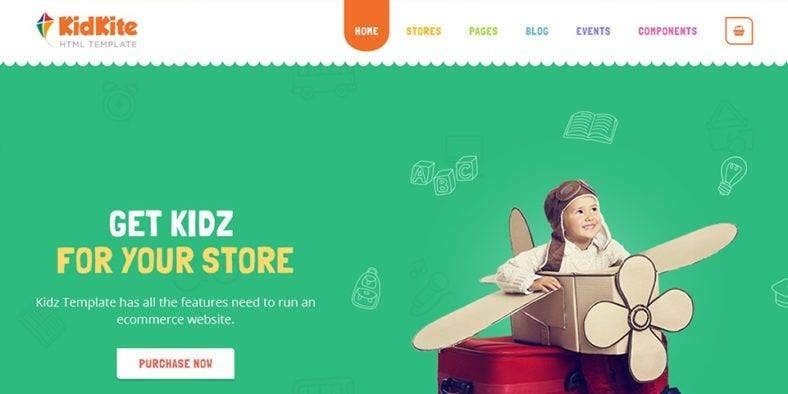 KidKite is another HTML template that is used for day care centers, kindergartens, and schools for kids, or an eCommerce website for young children. It is a fully responsive, clean, and modern multipurpose theme with 37 HTML pages which are optimized for high performance and customizability through CSS or Sass. Aside from these, it also includes a Coming Soon Countdown template and a retina-ready design that is compatible with all major browsers. 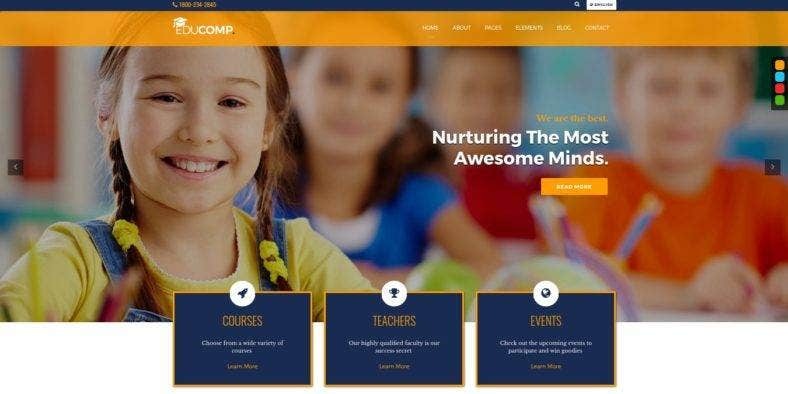 A responsive website theme for education, EduComp is a powerful HTML5 template designed with complete education-specific elements that can cater to any educational business or industry. It has a fully responsive design that looks great on any device and includes a courses grid, courses list, course detail page, teachers page, teacher’s profile page, and events and events detail page. It also has five styles to choose from, 35 plus HTML, and other awesome features. The next website theme featured on this list is Kidz School. 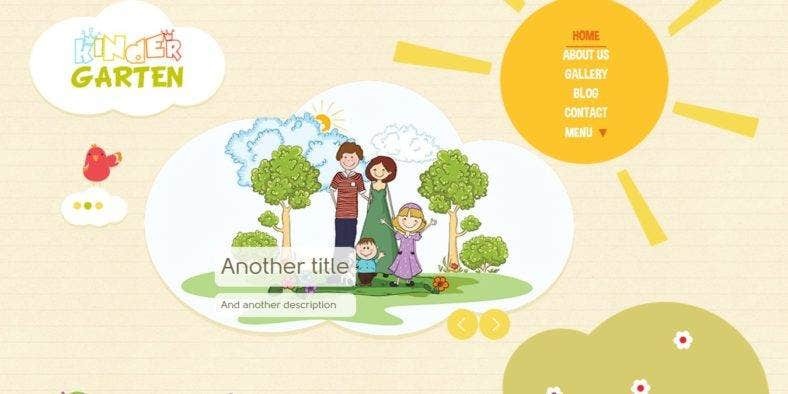 Just like its name, this is a multipurpose children and kids HTML template that can be used for kindergarten education and other kids-related website. It is fully responsive with a clean and modern design that attracts both kids and adults’ attention. Powered with the Bootstrap framework, this theme comes with four home page variations, 58 inner page templates, two headers, three footer options, and many more. 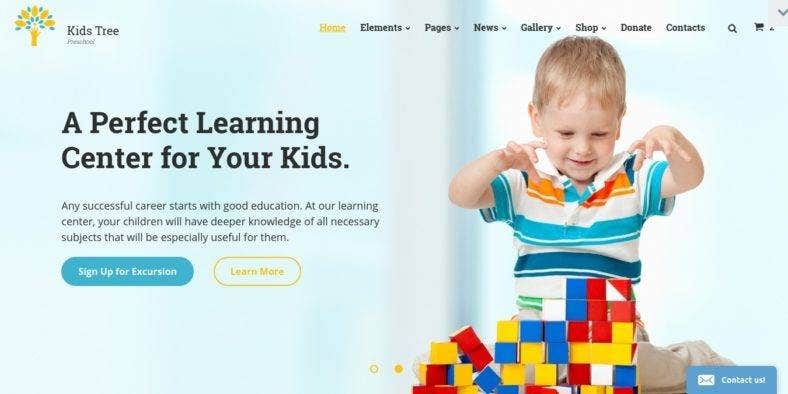 Another education and school website template is Kindergarten, a creative, modern, and beautiful HTML theme that suits any kindergarten, pre-school, daycare, and other similar websites. It features a responsive design with a choice of boxed or RTL layouts, multiple blog and gallery layouts, multi-level dropdown menu, Font Awesome icons, Google web fonts, jQuery-enhanced slider and effects, unlimited color variations, and so much more. 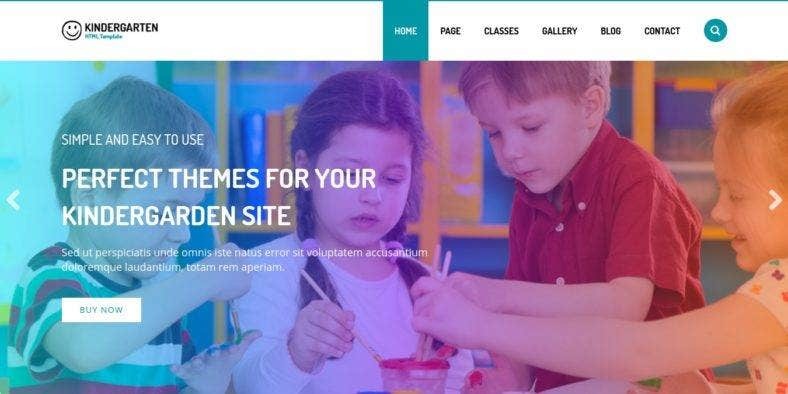 This children and kindergarten HTML website theme comes with a super clean and ultra minimalist aesthetic that is perfect for any websites related to kids and education. 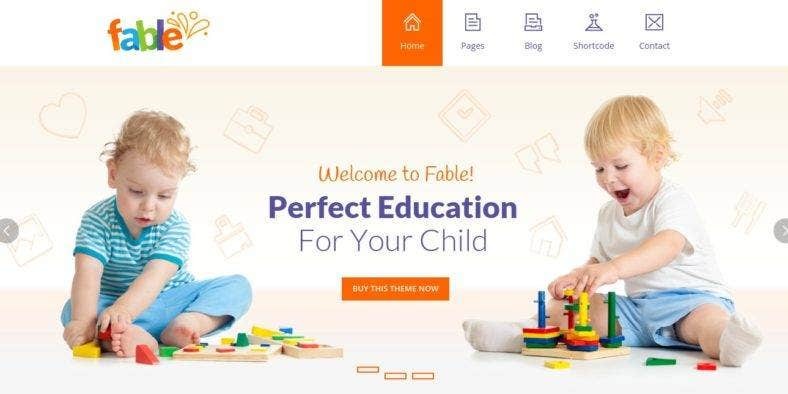 Fable has a responsive and retina-ready design that is integrated with some cool and trendy features which include over 35 content elements, a Slider Revolution, scrolling one-page layout, pricing plans, contact forms, counter boxes, gallery, testimonials, and a number of education-related pages. 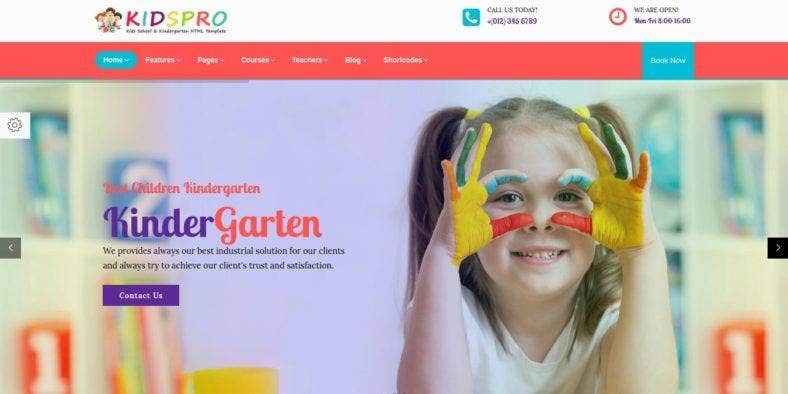 Kindergarten, the second of its name, is another HTML website theme based on Bootstrap 3 and designed for kindergartens, pre-schools, nurseries, and other similar types of websites. It comes in 12 fully-layered PSD files plus two with background textures as well as editable vector illustrations for easier customization. The theme is also fully responsive which makes it adaptable to any device, and retina-ready so it adjusts seamlessly to any screen size. 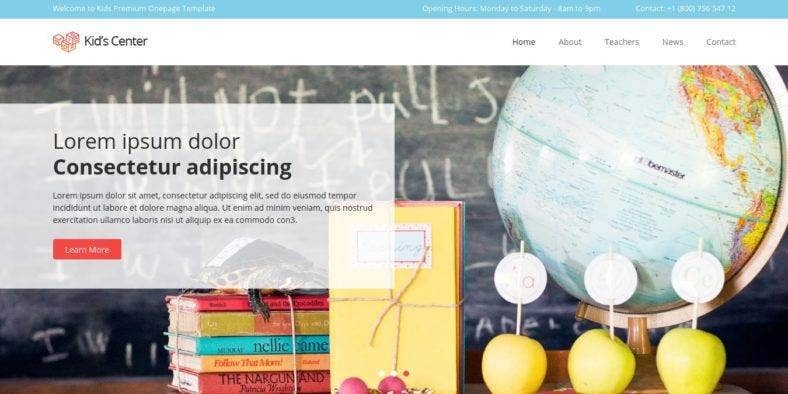 Next is a library of templates with pre-defined elements that help you build a great and stunning website for kindergarten schools and other kid’s educational institutes. Built with Bootstrap 3, Kids Pro has a fully responsive layout which fits perfectly on various displays of different devices. It also comes with 12 home page variations with a choice of one-page or multi-page layouts and features such as the Revolution Slider, responsive Mega Menu, etc. Then, we have Saratov. 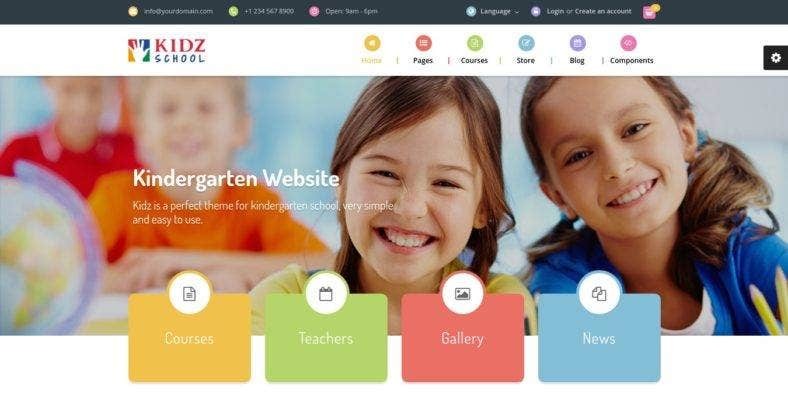 This kindergarten and school website theme is developed with standard HTML5 and CSS3 technologies and functionalities on the latest version of the Bootstrap framework. Therefore, it includes state-of-the-art features such as smooth transition effects, cross-browser optimization, parallax background image, full-width and boxed layout options, awesome gallery showcase pages, creative blog pages, Google Fonts, Font Icons, and more. Here is another HTML website theme for kindergartens, schools, child care, and other kid-related websites. Kindergarten School is a robust HTML5 theme packed with loads of great options and features. Bootstrap-based, it has a fully responsive deign with parallax effects and very smooth transition animations. It also features a working Contact Form that helps customers reach out to the website owner, and a W3C valid code for easy customization. 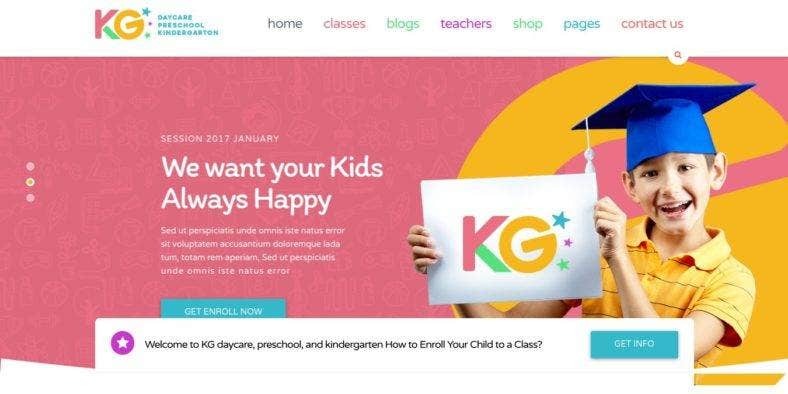 The stunning and beautiful web design tool you see above is another school and kids website theme called Kindergarten, for obvious reasons. This outstanding and eye-catching HTML theme is especially created for professional child care centers, preschools, and kindergartens. It features superior design quality with a full-width background image slider with a colorful filter, easy-to-navigate layout, and other awesome functionalities. Kid’s Center is a single-page website theme built especially for organizations and institutions that aim to provide quality education to kids. It has a clean and fresh design with a valid and optimized code so it can be customized easily and used to present courses, programs, and other services. Moreover, the theme includes lots of features as well as full responsiveness, easy color management, high speed, and cross-browser compatibility, among others. 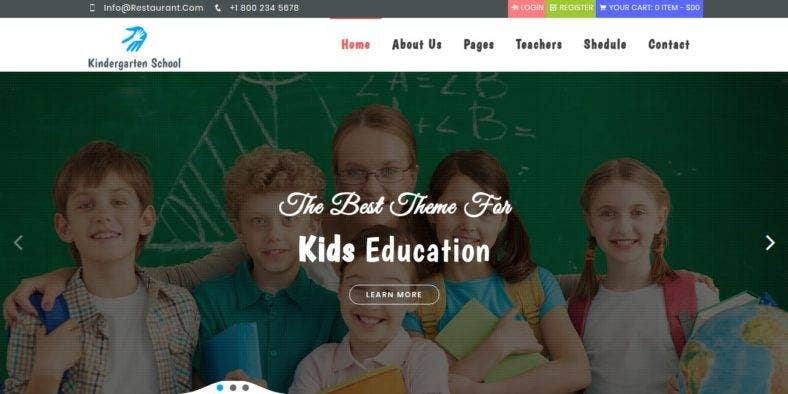 To end this list, here is a responsive children and educational website theme with a colorful and flat design that is trendy and modern. Kids Land is a premium template that comes with 15+ HTML5 pages built using the Twitter Bootstrap framework, so it has a number of cool features and is easy to customize. It features a mobile-friendly layout, Google Web Fonts customization, Font Awesome icons integration, a working contact form, and awesome customer support. There is quite a stigma of parents not being able to trust child care establishments fully and quickly. It is understandable that they can be protective of their kids. That is why one of the most important things you need to consider in designing a website for your kindergarten or school is to include all the essential details in your content. It should be streamlined and easy to use, filled with trendy and state-of-the-art features that will enhance its look and functionality, just like the website themes and templates listed on this article. 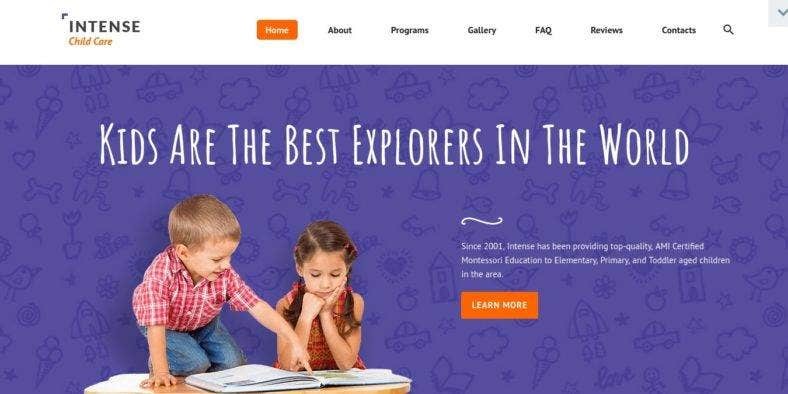 And while you are here, you can also take a look at our list of the best kindergarten WordPress themes for more ideas and inspiration, only here at Template.net.